President Donald Trump on Friday threatened to impose a 20% tariff on imports of cars from the European Union. The move would be a huge escalation of Trump’s ongoing trade conflict with the EU. Trump already hit Europe with steel and aluminium tariffs, angering EU leaders and triggering retaliation. Trump in May had directed the Commerce Department to launch an investigation into imported autos, similar to the procedure that led to the recent tariffs on steel and aluminium imports. While the results of that investigation are still weeks away, Trump raised the specter of tariffs on Twitter. A spokesperson for the Commerce Department told Business Insider that the investigation is still ongoing. Trump has long been fixated on imported cars. During a recent panel, his former economic adviser Gary Cohn recounted a story in which, he said, Trump asked why all cars in the US weren’t made domestically. New auto tariffs would be a massive escalation of the already intense trade fight between the US and Europe. Leaders from the UK, Germany, and France slammed Trump’s decision to hit the EU with steel and aluminium tariffs, and the bloc responded with tariffs of its own. In total, the US imported over $US43 billion worth of vehicles for people transportation in 2017. That means the size of the tariffs would dwarf those on steel and aluminium, which hit a little over $US7 billion worth of EU exports to the US. European car manufacturers, including BMW and Mercedes-Benz, have a large presence in the US. In September, Mercedes’ parent company announced that it was investing $US1 billion in its Alabama plant. Tariffs on autos would have a devastating effect on the US economy, driving up the cost of cars for consumers and likely producing a drag on GDP growth. Additionally, the move could hurt thousands of auto industry workers. According to the Peterson Institute for International Economics, a 25% tariff on imported autos to the US would result in the loss of 195,000 US auto workers’ jobs. 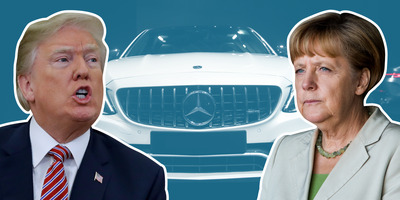 In an interview with Business Insider Germany last week, Bernhard Mattes, the president of the German Association of the Automotive Industry, said tariffs would hurt not only European automakers but the US economy as well. Mattes also said German automakers could not subsist without access to the US market. In a statement following Trump’s tweet, VDA said that the president’s tariff threat was counterproductive. The move could also prompt a response from the EU that would damage US automakers. The US exported $US10 billion worth of passenger vehicles to the EU last year. Automakers’ stocks took a hit following Friday’s news, with Ford and General Motors selling off sharply. European automakers – including Daimler, the maker of Mercedes, Volkswagen, and BMW – also sank. Daimler , BMW, and Volkswagen declined a request for comment. Additional reporting by John Stanley Hunter.